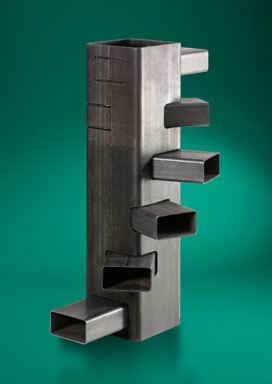 WEC Laser invests in the latest 3D tube laser cutting technology. The Tube Laser excels for the highest flexibility and user- friendliness, as well as for top quality and extremely precise laser cutting, on a tube diameter range from 12 to 220 mm and a bar weight up to 35 Kg/m. Equipped with tilting head, it allows on all sections (open and special profiles included) 3D cut processing. Thanks to the cutting head with tilting axes (3D) bevels and semi-bevels can be performed to simplify the fitting/welding operations of medium/large thickness tubes. The LT8 is the second laser tube cutting machine from BLM purchased by Laser Engineering UK over the past 12 months and follows a Â£1.5m investment in new laser machinery for 2010 across our laser division, including a 7KW Trumpf 4m x2m laser cutting machine that now allows the company to cut up to 30mm in stainless and mild steel, and 20mm in aluminium. Description Latest tube & box laser cutting technology. 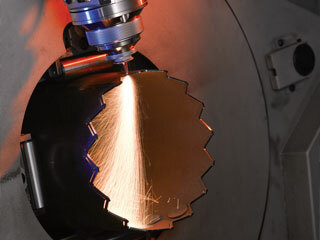 With two state-of-the-art tube laser cutting machines working around the clock, WEC Laser can offer laser cutting of tube, box and most open profiles such as angle and channel with a RotoLas capability that enables laser tube cutting and laser box section cutting up to a maximum envelope size of 414mm, 3m long and 12mm thick. Our tube laser cutting machines can cut tubes and profiles with large diameters and wall thicknesses without sacrificing productivity no matter how complex it might be. Description 3D Laser Cut Box Section.